The game is usually played with a standard 52-card deck and is best played with 3 to 6 players. The goal is to collect the most sets of four cards of the same rank (Quartetts) by asking other players for cards they might have. Each card displays a picture of an object or phrase we want to practice, and under the picture there’s a list of other 3 objects belonging to that set. Five cards are distributed to each player (7 if only 2 players are playing), and the rest of the cards is placed face down on the table, in the «fish pond». The first player – with the intention to collect all four cards of the same set – starts by asking another player if they have a certain card. If the person asked has that card, they have to give it to the player who asked for it, and the player who asked for the card gets another turn and may ask for another card. If the asked player doesn’t have that card, they say «Go fish!», so the player who asked for the card has to draw a card from the «fish pond». If the drawn card is the card he wanted, the player must show it to the others and gets to keep it and draw another card. If the drawn card isn’t the card they needed, it is the next players turn. The game continues until either someone has no cards left in their hand or there are no more cards in the “fish pond”. The winner is the player who then has the most sets of four. For extra strategy excitement, the players can play in paris and specifically focus on trying to guess which of the other player pairs have the cards they need. Our little German learners will immediately think of the Quartett game. The Quartett deck mostly consists of 32 cards, ie 8 quartetts. Consequently, a Terzett is a game where sets of 3 cards are collected, and it is usually played with 18 cards that form 6 terzetts. 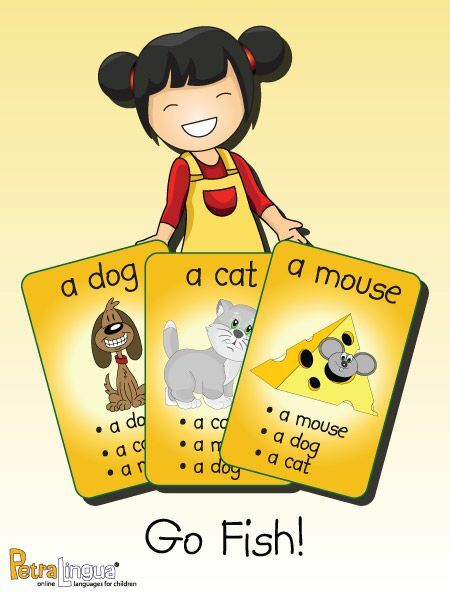 These versions of the game are suitable when we want to practice the vocabulary of a topic that can be divided in three or four sub categories, like the 4 seasons for example. We suggest to play a round of Go Fish! with this set of 52 cards prepared to repeat our Clothing and Colors vocabulary. Each clothing item is featured in four different colors, and each color is represented at least four times, so the players can decide themselves whether they’re collecting a set of a clothing item in four different colors, or four different clothing items in the same color – which gives them more opportunities to form the sets!